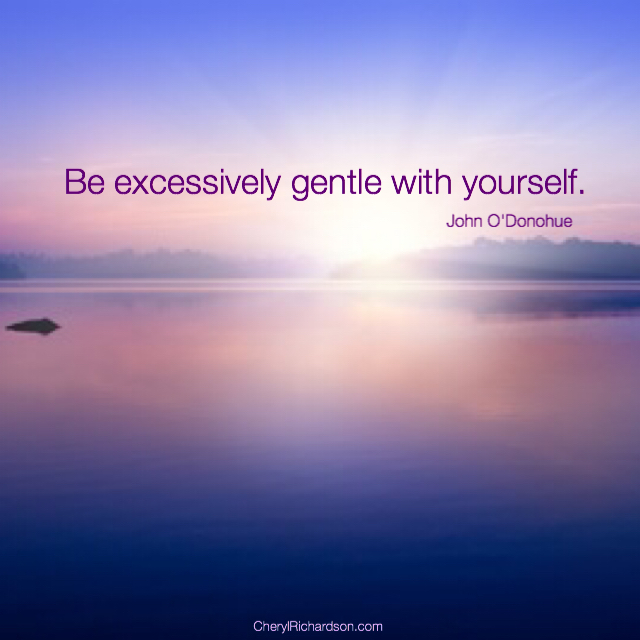 Week 6 – Here’s permission to be excessively gentle with yourself. Join Reid Tracy, president of Hay House, and me for a cruise to Alaska and enjoy the beauty of nature like you’ve never experienced it before. During the cruise you’ll learn about writing and publishing a book, crafting a successful speaking career, designing a social media campaign, and much more. Each workshop is an interactive coaching clinic that will give you the hands-on support you need to build a bigger audience for your work. You can get all the details here. I’m sitting here in my office, bathed in the cool light of winter. The winds are howling outside, lifting the powdery snow high in the air. Now and then I swear I see a dancing, white fairy, but she quickly disappears with the next strong gust. I’ve just finished readying our house for a family gathering – a Christmas party postponed when my dad became ill just before the holidays. I’m relieved and happy to say that he’s doing better and I’m looking forward to having all of us here later today. One of my projects was to complete this blog. As I thought about what to write, I checked email and discovered that my good friend, Nanna, sent a poem written by one of my favorite poets – John O’Donohue. As soon as I finished reading it, I knew I wanted to share it with you. It captures so well the journey of coming home to ourselves after doing too much. So sit back, take your own slow, deep breath, and let John’s words flow through you like music. And if you haven’t read his books, I suggest you give yourself a treat. Every single one is delicious. I especially love his book called, Beauty. Here’s a short TED talk filled with poetry that leads to self-love. You can watch it here. Thanks, Gae!